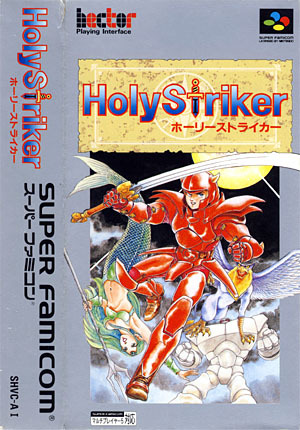 Holy Striker is an unusual mix of breakout and adventure game published by hector in 1993. The evil arch mage Wylde is taking over the world and must be stopped. The future of the four kingdoms is at stake and the king summons his last warrior to his court to save the world. But standard weapons are ineffective against the countless creatures that haunt the darkest corners of the world - our hero is not any kind of warrior, he is the last Firestriker ! This skilled fighter uses his sword and a magical orb called the Trialight to strike his enemies. Various dungeons are scattered across the kingdom and an overhead map shows our hero's position and available locations to explore. However, only a few need to be completed in a specific order and the player soon decides what stage to go on next. Each dungeons is made of vertical rooms and the goal of the game is for our Firetrisker to fight his way up to the exit. Our hero must hit the magical orb to send it at the four corners of each room, killing monsters or destroying obstacles on its path. The orb gets however pulls down towards the bottom of the screen and letting it fall eats up a precious life. To help our hero in his quest, a mage is positioned at the bottom of the screen and can catch the orb before it falls off (shoulder buttons control his position). Power shots come in limited quantities and can trigger powerful blows. As expected, the game features power-ups usually hidden inside chests or dropped by defeated enemies - they come in different flavors but more commonly refill health, give an extra Power-Shot, an extra life and so forth. In a way similar to Zelda, heart containers scattered throughout the game can be collected to increase the player's maximum health. Finally, more Firestrikers can be recruited and can be played instead of the main character. A multi-player mode is also available where up to four players can play simultaneously. Long ago, on a distant world, there were four kingdoms governed by four constantly fighting tribes. One day the Arch-Mage Wylde proposed a solution to the constant battling. He offered to bestow the title of FireStriker and ruler of the four tribes, upon the one who could control the elemental orb of fire known as the Trialight. However, the Arch-Mage Wylde had a hidden purpose. His true reason for bringing peace to the world was so he could destroy all four kingdoms at once. Now, Salder, the last FireStriker, has offered to risk his life in the battle against Wylde and his monsters. The time has come to release the Trialight. The world's future hangs in the balance. Holy Striker was a nice surprise. There is nothing groundbreaking here, but the gameplay is inventive enough to be genuinely surprising. 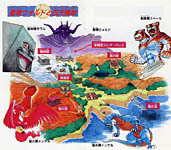 You'll find influences from all over the gaming spectrum - the top-down world map, the slime monsters, the mythology theme, the pinball/breakout favored gameplay and so forth. Controlling the game can be clumsy and imprecise at first but you'll be surprised how quickly you can get the hang of it. Only boss encounters are long and frustrating moments and aiming at their weak spots can be annoyingly tricky. 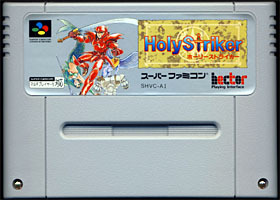 While Holy Striker's influences are obvious, it can't be accused to introduce its own ideas to the formula. An fun and original game.